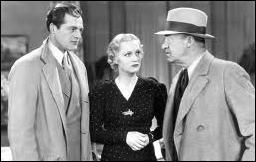 » Movie Review: MURDER ON THE CAMPUS (1933). 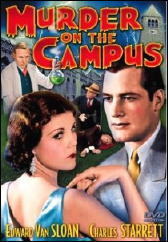 Movie Review: MURDER ON THE CAMPUS (1933). MURDER ON THE CAMPUS. Chesterfield Pictures, 1933. Shirley Grey, Charles Starrett, J. Farrell MacDonald, Ruth Hall, Dewey Robinson, Maurice Black, Edward Van Sloan, Richard Catlett. 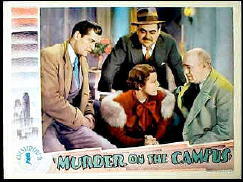 Based on the novel The Campanile Murders, by Whitman Chambers (Appleton, 1933). Director: Richard Thorpe. Obviously a change in title from the book to the film was in order, since I’m sure that not one person in a thousand knows what a “campanile” is, then or now. Though you could look it up on your own, what it is, is a bell tower, such as commonly found on college and university campuses. And the significance of that is, is that is where the body of a student is found, shot to death in the temple with the wrong hand. What makes this otherwise ho-hum of a mystery interesting is that he was the only one at the top of the building. He was playing the carillon when the music suddenly stopped, and a shot rang out. No one is seen leaving the tower. The only door at the base was watched by a throng of students. No one is found in the tower, either. The building is too high and too far out of range for a bullet to have killed him from outside. It is definitely murder, though. There is no gun in the building, and there are no powder marks on the body. The detective in charge of the case, Police Captain Kyne (J. Farrell MacDonald), a grizzled veteran of the force who doesn’t seem to mind brash young reporter Bill Bartlett (Charles Starrett, boyishly handsome and long before he became the Durango Kid) tagging along as he randomly interrogates suspects and hunts for clues. Bartlett has his own reasons for keeping an close eye on him. Besides getting the scoop for his paper, he’s in love with one of the chief suspects, Lillian Voyne (Shirley Grey). The latter is not only a student at the school (unnamed, unless I missed it) but she’s also a singer at a local night club. Strangely enough, she’s seen studying for a chem exam for all of two minutes in the movie and not singing once at all, not for an instant. I don’t know why, but I found myself disappointed. Which is an attitude beside the point, I suppose, or it is? But I have not forgotten about the locked room aspect of the murder, along with the mysterious fact that the gun that used to commit the crime was somewhere else at the time. The gimmick, as I would readily agree to call it, is a good one, and it would be even better if the investigation conducted by both of the separate parties (police and reporter) made more sense. What I really like to do is to read the book and say that the original author did a much better job with it. I have a strong feeling that he did, but the fact is I don’t own a copy, nor is there one offered for sale right now by anyone on the Internet. I found part of the book in the Milwaukee “Sentinel” July 16 1933. It was apparently serialized in “American Weekly” section of the paper. It gave a recap of what had happened before then ran Chapter 10. Coincidentally, I just saw and enjoyed this movie a month ago. It is a rare Hollywood film of an impossible crime. Have been unsuccessfully trying to track down this book too. It is praised in Robert Adey’s bibliography LOCKED ROOM MURDERS AND OTHER IMPOSSIBLE CRIMES. Have read a few pulp short stories by Whitman Chambers. They are blandly written, in terms of story telling. But they have some solid mystery plots. IIRC, “campanile” is the standard Italian term for bell tower, especially near a church. It is much less common in English. Thanks for the link. If there’s an easy way to move around the scanned pages so you can read them, I sure wasn’t able to find it. But I can tell you that the film stuck very closely to the part of the novel I was able to read. I found only minor changes, such as changing the name of nightclub owner from Whitey Atwater to Blackie Atwater. Some of the dialogue sounded word for word. The book, though, has to fill in a lot more about the characters. That’s where the presentation in the movie seemed the skimpiest. The installment shown in the newspaper supplement comes early in the novel, so there’s no way of telling how close the ending of the film came to the end of the book, but I can’t see any reason why they shouldn’t be the same. My copy of Adey’s book on Locked Room mysteries has temporarily gone missing. It’s usually right next to me by the desk I’m sitting at now. So thanks for letting me know that The Campanile Murders got some favorable notice there. Makes me wish the book weren’t so hard to find. The writing is a bit crude by today’s standards, from the portion I was able to read through Michael’s link, but the same might be true about most mysteries written in 1933.